If your piano seems difficult to play, has uneven touch, doesn't sound as nice as you wish it did, there is a very good chance it can be improved, often substantially. Many pianos are not operating as efficiently as they were originally designed to. People often do not realize that a piano, in addition to being an expressive instrument, is also a machine with ten thousand moving parts. These parts largely consist of felt and wood and other non-stable materials that wear, compress and shrink/swell with humidity changes seasonally. Given time, all pianos will gradually drift away from proper performance. 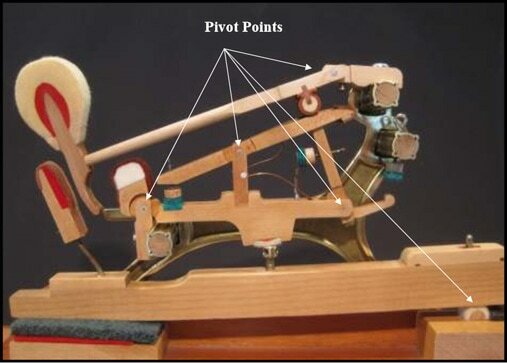 The performance of a piano action tends to decline, due to the compression of felt, warping of wood, and other types of wear. Andy's Piano Service can skillfully restore it to optimal precision, in a process called regulation, which involves many adjustments. New pianos are not perfectly regulated when released from the factory, or quickly lose their regulation when moved to their new home, and will benefit from regulation in the home. The goal of regulation is to make the piano's touch and sound consistent across all notes, allow it to comfortably achieve the widest possible range of dynamics, and make the keys responsive to even the most rapid or most subtle motions of the player. A half day or full day service appointment is the only way to make a significant improvement in your instrument. I recommend that a piano be tuned every six months, or at least once each year. The piano is primarily made of wood and is affected by climate change: wood swells and contracts with variations in humidity and temperature, resulting in a change of string tension, changing the "tuning." Optimal tone quality will be maintained when it is tuned on a consistent basis. When a number of years pass between tunings, the pitch will drop, often enough that two or more tunings will be needed to restore the pitch to A-440. I bring the pitch back up to normal over the course of several tunings, particularly when it has dropped a step or more. Raising the pitch too far in one tuning may result in broken strings making it is impossible to do a quality tuning, as the pitch will slip until the strings stabilize. I will be glad to work with you in setting up a schedule. I keep a record of each tuning appointment and will contact you after one year has passed. Tuning cost (in the Lynchburg area) is $95.00 and $45.00 for a pitch raise. The regulation procedure includes inspection, repair and cleaning of the piano keyframe, keybed and action. Necessary repairs are made, friction is measured and reduced as needed followed by adjustments of key height, dip and level, key travel and spacing, hammer shaping, alignment, spacing and travel, all major action alignments, timing and parts synchronization, repetition spring and repetition lever adjustments and a host of other fine alignment and related adjustments.